That's how long recovering addict Sophie's been drug-free. Four months ago her best friend Mina died in what everyone believes was a drug deal gone wrong - a deal they think Sophie set up. Only Sophie knows the truth. She and Mina shared a secret, but there was no drug deal. Mina was deliberately murdered. Forced into rehab for a drug addiction she'd already beaten, Sophie's finally out and on the trail of the killer. But can she track them down before they come for her? Oh my god this book cut my heart into a billion pieces and I loved every minute of it. A few years ago, I wanted to write a book like this (and I actually did, for NaNoWriMo) because I really wanted a book like this to exist in the world, but Tess Sharpe obviously did it better than I could ever dream of doing. The book I wanted to write was, as Tess Sharpe described Far From You in an interview with Malinda Lo, "a love story tied in a murder mystery bow"-- and not just any love story, but a love story about two girls. It was such a thrill to be able to read Far From You, to see an idea I've always been desperate to see in writing realised so beautifully. 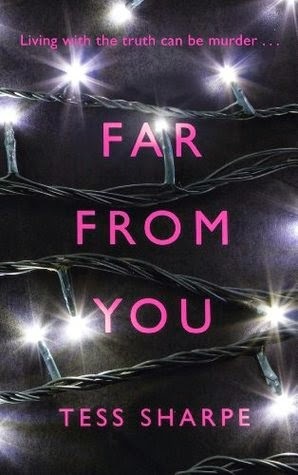 Far From You is the story of Sophie Winters, whose best friend, Mina Bishop, was murdered right next to her. Sophie is an addict. She's disabled. These are the things we learn about her right away. And slowly over the course of the book, as chapters alternate between the present and the past, we learn about her friendship with Mina and the love they have for each other. Their love story is at the very heart of this book, and it is so stunning and heartbreaking and powerful. This book is ultimately about the bravery that we can derive from our most profound loves. And oh, Sophie is so brave, and she loves so deeply. She's incredibly strong and tough and she's been through so much. She's also bisexual. I'm going to take a moment here to do a little happy dance because BISEXUAL HEROINE WITH A COMPLEX AND BEAUTIFUL LOVE STORY WITH A GIRL OH MY GOD. Okay, I need to remember to breathe. I can't really think of much that I don't like about this book. I think my one complaint is that the mystery aspect of the book was perhaps not as well-done as it could have been. I feel like there simply weren't enough hints in the rest of the book to lead up satisfyingly to the big reveal at the end. But that's okay, since I found that I was really in this book for the love story rather than for the mystery. I did think the book was gripping and full of suspense; I couldn't stop reading. I just really like how the book doesn't make anything seem easy. Sophie's recovery from addiction, her grief over Mina's death-- these are all things that are difficult and they will leave a mark on her forever. She will always be an addict, and she will always be someone who lost her best friend and a great love at a young age. Moving on is something that takes time, and it's not something that can be completed within the span of this book, or even ever. The flashbacks become more and more crushingly beautiful as we approach the end of the book, and I was just overwhelmed with the sense of how much history Sophie and Mina shared, how much Mina meant to Sophie. I feel like the alternating chapters were so effective because one moment you'd be in the present, where Mina is dead, and one moment you'd be back in the past, when Mina is still so brilliantly alive, and it feels like a punch to the gut every time we go back to the past, just as it must feel for Sophie, to remember Mina or to see Mina in her dreams, and then to come back to the present, to wake up, and know that Mina is gone and will never come back. It was both painful and wonderful to see how mature Sophie becomes at the end of this book. I just adore her so much. Her resilience and her strength. I think she's a real hero. So, if you what you want is a murder mystery pure and simple, you'll probably be disappointed by Far From You. But if you keep in mind that this is a love story tied in a murder mystery bow and not the other way round, you might just end up loving it as much as I did. Cynthia, you have sold me! As soon as I read the first line, I knew that this would be perfect for me. I haven't read a murder mystery in absolutely ages. Plus the cover of this one is beautiful. So I have to read this soon don't I? Lovely review and happy reading! The cover is so nice! You don't really realise its relevance until the very end of the book, but it's perfect. It kind of looks dark and vaguely sinister at first glance, but it takes on so much more meaning once you've read the book. Awesome review! I have to say I think there were enough clues/hints where the murder mystery was concerned. Enough that I pegged, if not who killed Mina, who was involved in what she was investigating. That person I thought did everything from maybe half way. So I have no problems with the murder mystery, it was awesome. The love story was just so beautiful and heartbreaking. This story was just completely wonderful all together. I loved it so much! Wow, you guessed it? That's awesome! I feel pretty stupid now, haha. I sort of zoomed through the book pretty quickly though, so I may have missed something when I read it. I should reread it when I have time. Anyway, glad you liked my review and thanks for commenting! It really was a great book. You make this book sound so good! The love story sounds heartbreaking but really touching. I'm curious about the murder aspect as well. I'm even more eager to read this now! It is so good! And god, the love story is just. It's so sad, all the things they could have been but weren't because of Mina's tragic murder. You really get a sense through the flashbacks of what they could have been together if they had been allowed more time. I hope you enjoy the book when you do read it! (: Thanks for dropping by and commenting.